A 57-year-old woman with pre-dialysis chronic kidney disease (CKD) was hospitalized because of fever and fatigue. On admission, increased inflammatory response and pyuria with bacteriuria were observed. Pyelonephritis was successfully treated with antibiotics, whereas her fatigue continued and she developed progressive hypercalcemia and hyponatremia; serum sodium level, 116 mEq/L and corrected serum calcium level, 13.4 mg/dL. Plasma concentrations of adrenocorticotropic hormone and cortisol and serum luteinizing hormone were under the detection level. Although the reaction of other anterior pituitary hormones and the serum antidiuretic hormone (ADH) was preserved, the response of serum luteinizing hormone to administration of luteinizing hormone releasing hormone was impaired. Magnetic resonance imaging showed no structural abnormality in the thalamus, hypothalamus, and pituitary gland. She was diagnosed with adrenal insufficiency caused by partial hypopituitarism in concomitant with pyelonephritis. After starting hydrocortisone replacement, serum levels of sodium and calcium were rapidly normalized. 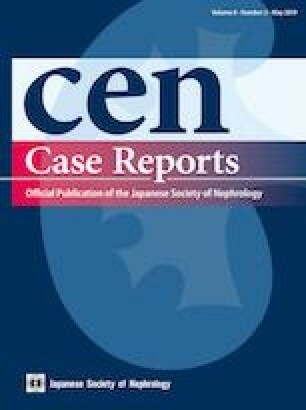 This case highlights the importance of adrenal insufficiency as a differential diagnosis of hypercalcemia in patients with pre-dialysis CKD, especially when hyponatremia was concomitantly observed. Besides, infection should be considered as an important trigger for the development of latent adrenal insufficiency since it could increase the physiological demand of corticosteroid in the body. Also, CKD may enhance the magnitude of hypercalcemia since CKD patients have decreased capacity to increase urinary calcium excretion. A written informed consent was obtained from the patient included in this case study.